Digitalizing business process is a very significant phase if you want to stay at the top of your vertical, which is made simple now with the launch of Dynamics 365 in the market. Microsoft Dynamics 365 is a next generation suite of intelligent business application where you can maintain all your business happenings right from ordering new raw materials to end customer sale and analyzing data with business intelligence tools to predict future trends. Dynamics 365 is continuously evolving and adding advanced features very often since its release. Decades of experience gained from working with Dynamics ERP and CRM since its inception makes our consultants an ideal team to help you migrate to Dynamics 365 from applications like Salesforce, QuickBooks, Spreadsheet, Dynamics CRM, ERP or other legacy applications. As early adopters of Dynamics CRM (practicing since version 1.0) Congruent, a Microsoft gold certified partner helps in migrating to Dynamics 365 for managing prospects, customers & sales within an integrated system. The depth of our expertise across industries, accurate knowledge of various business processes, helps us to identify your business process, help you choose and buy the right Dynamics 365 licenses and perform the migration in line with your business needs. We can help you migrate from Dynamics 2011, Dynamics 2013, Dynamics 2015 & Dynamics 2016 to Dynamics 365 seamlessly with an organized setup and defined parameters for a better workflow. Our Dynamics 365 consultants will recommend best practices and ideas to ensure your migration to Dynamics 365 is done in a seamless way. Microsoft Dynamics 365, Business Central, with all the Dynamics NAV capabilities & with the power of Cloud attracts companies to replace the existing accounting package and legacy ERP systems with a complete solution to manage finances, operations, sales and customer service. The subscription based cost structure from Microsoft is very attractive for the Customers. There are no direct methods to migrate to Dynamics 365 Business central at this moment but Microsoft is working on the tools for migration to Dynamics 365 Business Central from NAV. Though Rapidstart Services in Business Central version will be helpful for the quick setup of the company, we can expect much updates on the migration tool soon. The next generation flagship ERP, Dynamics 365 unified with the capabilities of Dynamics CRM, Dynamics AX and Office 365, powered by both the Cloud and On-premise options, promote seamless integration of applications, ensuring effective workflow. The Dynamics GP Data migration extension helps migrating Chart of Accounts, Customers & Open documents, Vendors & Open documents, Inventory & On hand Quantity details from Microsoft Dynamics GP to Dynamics 365 Business Central. 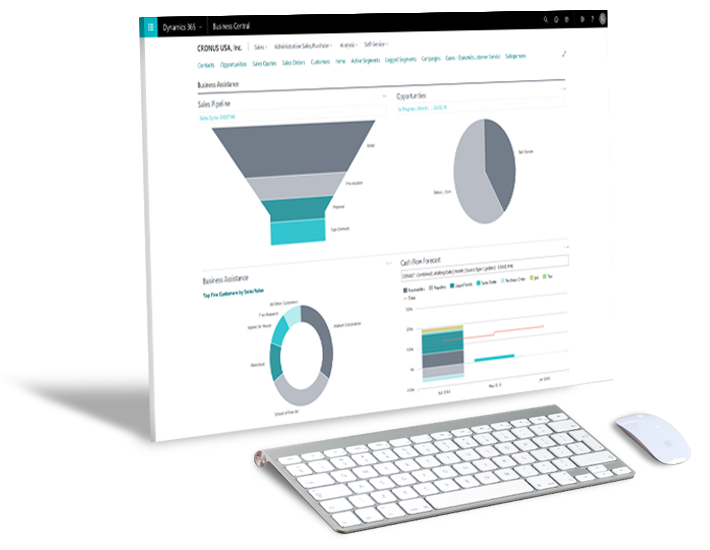 Though the assisted setup is a great start for cutting over to Dynamics 365 Business Central, Congruent Consultants will do the complete data migration with the manual efforts thereby ensuring the successful transition to Business Central Edition. Congruent has been successful in Dynamics GP Consulting for around 13 years. We can help you migrate from Dynamics GP to Dynamics 365 Enterprise edition with the help of ETL tools from our Business Intelligence team. Our Dynamics GP +Dynamics 365 + ETL Specialists can help you to migrate to Dynamics 365 in a seamless way. Though Dynamics SL has been targeting the project centric organizations of manufacturing and Non-Profit type, Dynamics 365 is a flagship ERP that targets all the industries embedded with the latest and successful technologies from Microsoft. Congruent has been in Dynamics SL consulting for around 14 years and Dynamics AX Consulting for around 10 years. Our experience in dealing with the data structures in both the products, we can help you in smooth data migration from Dynamics SL (2011/2015) to Dynamics 365, Finance & Operations, Enterprise edition. Migrating from Quick books to Dynamics 365 Business Central using Data Migration extension helps importing the Chart of Accounts & balances, Customers & Open documents, Vendors & Open documents and Inventory & On hand but the complete transactional data will be imported into the system with the manual effort. Congruent with its diverse expertise in Dynamics can guide you to ensure effective transition to Dynamics 365, Business Central. We will help you choose & buy the right Dynamics 365 licenses for your business model & requirements. Helping you migrate the data from source systems to Dynamics 365 using migration tools and perform customizations where necessary to address your unique migration needs. Provide training for your users to get familiarized with Dynamics 365 and post migration support to ensure smooth functioning of your system. Migrating to Dynamics 365 is a sensible and safe decision. Here is our reasoning on why migrating to Dynamics 365 is worthwhile. Plan Your Dynamics 365 Migration Effectively!